For those who are interested in taking their CBD daily and with minimal hassle, CBD Drinks like the ones featured here are a great solution as well an effective and money-saving option. CBD Drinks are easy to consume anywhere and at any time and many also come with other healthy ingredients included in the mix. Of all the amazing CBD Products to hit the market in recent years, CBD Drinks are fast becoming more popular for people who want to take their CBD in the form of a tasty soda rather than CBD Vape Juice or things like CBD Oil or edibles. It was only a matter of time before beverage companies would jump on-board, infusing their sparkling delights with the cannabis compound CBD. These CBD Drinks won’t get you high as they contain no THC, but they can leave you feeling refreshed and relaxed, as well as, adequately hydrated, especially during the summer months. If the pundits are correct, CBD-infused drinks like sodas are to be the next big thing to take the wellness world by storm. Some people even think that CBD Drinks could become as popular as regular soda drinks in time as people enjoy the effects they get from taking one of nature’s most healthful compounds while hydrating. Even though CBD Drinks aren’t as effective as other forms of CBD in terms of delivery due to lower CBD Concentrations, they are considered to be a healthy and effective way of staying hydrated throughout the day and are also favored by those who already include things like CBD Oils and Tinctures in their daily regime. Let’s take a look at some of the best and most well-known CBD Drinks on the market; including mouth-watering infusions from companies at the top of the CBD industry like CBDfx, Sprig, and MountJoy. Whether it’s sparkling CBD water that floats your boat or delicious CBD-infused sodas, there’s bound to be something here that tickles your fancy. Sprig’s CBD-infused sparling soda range uses only the best quality CBD Extract, all coming from Organic Hemp cultivated and grown in Colorado. Each Sprig CBD Drink is infused with 20 mg of finest CBD and is available online as well as throughout many retail outlets nationwide. Sprig’s CBD Drinks contain zero THC which means they won’t get you high. You don’t even need to shake the can before drinking as Sprig takes pride in perfectly blending their beverages to include no sediments at all. The whole Sprig range is available in original and no sugar options and they come in a variety of tantalizing flavors including Citrus, Lemon Tea, and Melon. Inside each deliciously refreshing Sprig soda, there’s 20 mg or premium CBD Isolate. This isolate is made from totally natural and organic, agricultural Hemp and is expertly blended with other natural ingredients and flavorings for that tasty, relaxing beverage every time. All Sprig products are made in a state-of-the-art, food-grade production facility with close attention to detail throughout the delicate production process. When Alex Mountjoy founded his CBD company, he started life with humble beginnings from his backyard barn in Sonoma County. His mission was to combine the tremendous health benefits of CBD with sparkling water, and he was successful in achieving that goal. Having moved to more extensive facilities in the form of warehouse space in California, the MountJoy range of finest CBD Drinks are very popular with many people. Coming in multipacks, Each mouth-watering bottle of MountJoy Sparkling CBD water comes with 10 mg of CBD per bottle. It is fast acting and effective, containing a full spectrum CBD infusion. It’s also portable, resealable and therefore very convenient for those wanting to take their CBD on the go. With zero calories, carbs or sugars MountJoy Sparkling CBD tastes excellent and comes in a range of flavors including, Blackberry, Lemon Lime and Natural. If you have any connection with the world of CBD at all you will most likely have heard of CBDfx; one of the biggest and most trusted names in the CBD industry. When you buy products form CBDfx, you can rest assured that you are getting the best quality, safest and most effective CBD available anywhere, and their hundreds of five-star reviews from verified and satisfied buyers are a testament to that. And while CBDfx offer one of the widest and most varied ranges of CBD products available online, they have recently introduced their fantastic CBDfx Chill Shot range. CBDfx Chill Shots are ready to drink straight out the bottle and come in two great flavors; Lemonade and Berry. Each Chill Shot contains 20 mg of the finest CBD extract available. Their CBD is organically grown and tested by third-party labs for purity, potency, and safety. What sets CBDfx’s Chill Shots apart from the rest is that they also contain 200 mg of L-theanine – a powerful amino acid found in green or black tea. The combination of the L-theanine and the Organic CBD is the reason customers keep coming back for more of these great CBD Chill Shots. Recess is another company who is serious about their CBD. 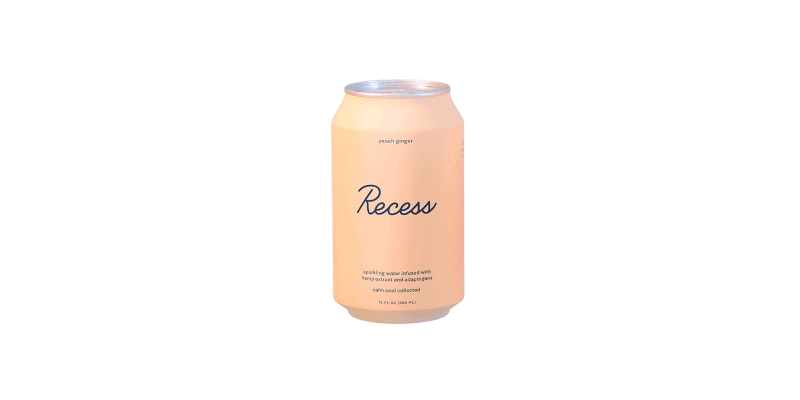 With one of the coolest CBD websites, Recess boldly use “Ingredients that make a difference” in their bespoke range of CBD Drinks. The mix of compounds and ingredients inside the minimalistic-design cans are intended to help the body and mind to maintain a balanced neutral state. And it’s not just finest CBD Extract you get from Recess, as their CBD Beverages also contain Schisandra, American Ginseng, and L-theanine; all healthy ingredients associated with wellness. While Schisandra is known to boost the immune system and balance sleep, American Ginseng helps with focus and improves memory. L-theanine – found in green and black tea – reduces stress and promotes calm. Each can of Recess CBD Soda contains 10 mg of full spectrum CBD, 200 mg of American Ginseng, 130 mg of L-theanine, and 200 mg of Schisandra. Recess offers a great range of flavors too, including Blackberry Chai, Peach Ginger, and Pom Hibiscus. For those who are interested in taking their CBD daily and with minimal hassle, CBD Drinks like the ones featured here are a great solution as well an effective and money-saving option. CBD Drinks are easy to consume anywhere and at any time and many also come with other healthy ingredients included in the mix. The fact that CBD Beverages also come in a range of delicious flavors and CBD Concentrations means that you can stay healthy and hydrated all day long no matter where you are. Many CBD Drinks also come in a zero sugar option for people who want to watch the calories and keep things that bit healthier. From all the great CBD Drinks featured here, we naturally have our favorites, although that is based on personal opinion. 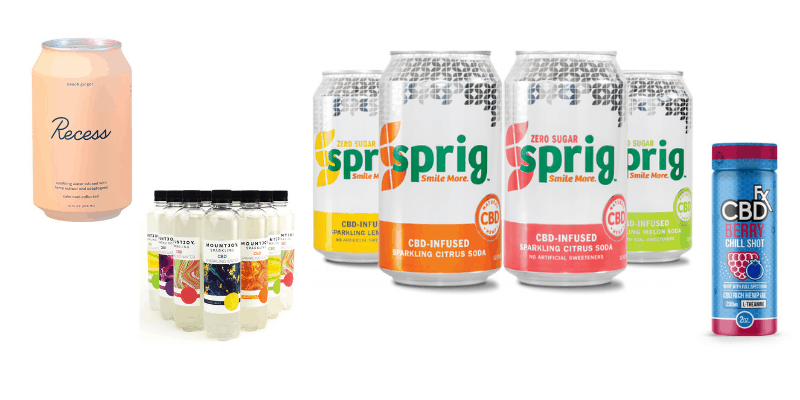 While all of these CBD Drinks are a great option, Sprig’s range of CBD-infused sparkling sodas are among the tastiest around and with a CBD Concentration of 20mg per can they also pack a punch for those wanting to feel the effects of the CBD inside. There are also great flavors to choose from including Citrus, Lemon Tea and Melon. No matter which CBD Drink you ultimately choose, the main thing is to ensure that you making your purchase from a reputable company who has an excellent reputation for using best-quality CBD Extract. Then, all you need to do is to choose a flavor that suits your palate, and you are ready to go through the checkout process. It’s also worth keeping an eye out for CBD Coupons that the companies offer from time to time, especially if you intend to take CBD regularly.